So everyone pretty much knows a lot about something, but not how to start a blog and make money with the knowledge they have. Most people don’t know how to go about starting a blog for money that is significant enough to be a long term career. Where Do You Start The Blogging Process? Well once you know what you want to blog about and are sure that you can earn enough money to make a living on it, you need to find the best blogging platform that supports your style. 1. Empower Network – For a review of Empower Network’s blog, read here. 2. Blogger – For a review of Blogger, read here. 3. WordPress – For a WordPress review, read here. 4. Tumblr – For a Tumblr review, read here. 5. Typepad – For a Blog.com review, read here. Those are all very popular blogs and have hundreds of thousands of members. That being said I chose to go with Empower Network because they combine WordPress with social media, SEO, linking tools, in-depth training, etc. Plus, ENv2 (Empower Network’s big blog update) is about to change the game completely. If you go with Empower Network I’ll help you set it up to get maximum results quickly. After you pick a blog provider, you can start blogging for money. To do that, you must have something to sell though that is related to what you blog about. You have an ebook, affiliate products or even a video series to sell through your blogging efforts. But, when starting a blog at first, you may not get any sales for a while unless you use some sort of paid advertising. You must blog consistently (every day for the first 50-90 days). After you really start getting ranked for keywords and topics in Google or other search engine results, then you can revert back to publishing new blog posts every other day, every 3 days or whatever works best for you. Fresh content is key when trying to rank on page one of search engine results, especially if you are trying to blog for money. When you first start a blog, keep in mind that if you write extremely valuable content for readers, the rankings will always follow. Google (by far the top search engine) has come out with many updates in 2013 to its algorithm, like Penguin and Panda. These updates really cracked down on low quality content that was only written for the sole purpose of getting sales and traffic from page 1 rankings. This no longer is effective and will get you penalized if you use the old black hat methods of ranking in Google. Now, since you are trying to start blogging for money, you need to understand what is the right approach to take towards doing that the right way. Do not spam backlinks using tools, do not spam social media sites with your links, and do not use one keyword phrase for 10% of your keyword density. Yes, keywords are important to have throughout your content. That being said, you must use various keywords and phrases that are all related to each other, instead of spamming the same keyword phrase over and over and over again. My advice, go use the new tool in Google Adwords called, “The Keyword Planner.” This tool is free and very useful for starting your own blog for money. It will always be useful to you, even after you become extremely experienced with blogging. With the Keyword Planner tool, you can research keywords and even find groups of them that are related and it’ll tell you the competition level and the monthly searches of each keyword phrase. Use it! When learning how to start a blog, you need to obviously know how to structure each new post in auser-friendly way. If you want to make any money with your blogs, you will have to make people want to keep reading more and more of your quality content. When someone first clicks on a blog post from search results or somewhere else, you have about 3-6 seconds to capture their attentionquickly before they leave and go to another website. So you want to use a headline that captures attention while giving you the chance to rank for a specific keyword topic. The title gets them there in the first place, remember that. Then those first few lines of your blog pose are also key. They lay out the foundation of the entire article and must outline what readers will learn if they were to read the entire blog post. Then, always have a picture or video after that first introduction paragraph to capture the attention of viewers and make them increasingly curious about what lies ahead in your post. Make people believe that your post is better than the competitions’ and will fully answer any questions the reader may have. Next, make sure and don’t use paragraphs that are 500 words long. Big paragraphs scare readers away and just make it harder to read. Notice how this post contains paragraphs that never get too long and everything just looks cleaner and more spaced out because of it. This greatly improves the user’s experience while reading your blogs. Stay on topic throughout the entire post as well, so that readers are not confused as to the point of the article. Plus, refer to other websites that have great content that relates to the keyword topic you are blogging about. Google appreciates the sharing of traffic and will reward you because of it. It also helps your post seem to have more information and links to information than the other competitions’ posts do not have. When starting a blog for money or even just for traffic, always try to have more quality information about the subject than your competitors. You will seem to be the expert on the subjectyou are blogging about and that will get you more and more traffic because of your distinguished blog content. Last but not least, if you are learning how to start a blog for money, you need to always make sure that you have a call to action and a link or two to your capture page/money site. An effective call to action should positioned at the end of your blog post after the conclusion to tell readers what you want them to do next. Since you’re starting a blog for money purposes, you need to tell them to go to a link to your capture page or money site so that you can hopefully get their email so they become a lead or get a sale right then. Also, keep in mind that you don’t want your blog to look like a straight up sales page. Keep banner ads under control on your blogging site. Take a look at the graph below that tells you the average web page content length of the top 10 search results for keywords. If you want to be on the top pages of Google search results, you need to have a lot of content in your posts. But, it can’t just be any content. Having 2500 words of nothing but rambling will get you nowhere and won’t help your search engine rankings one bit. You need to have a lot of content that is oozing with value that is related to the topic you want to rank for. Is it okay to do some speed blogging too? Yes, it would be pretty demanding to ask someone who is just learning how to start blogging, to write a 2500 word blog post everyday. The best way to do it, is to publish some speed blogs that are rich in value, while having media and about 500-700 words a few times per week. Then, write one super blog post each week that has 2000-2500 words and is of high quality and value, with a little media throughout to keep attention. For more stats on the correlation between content length and search engine rankings, check this out. So You’re Starting A Blog, What All Contributes To Rankings? 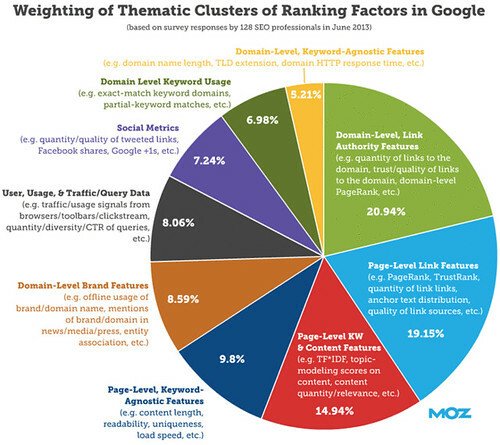 Here is chart that is based off a study from Moz.com, that clearly shows what SEO specialists observed to be the top ranking factors for sites in the summer of 2013. Let’s break down what this chart actually tells us. One thing it shows, is that building domain authority is key to your ranking success in the top results in Google. If you start a blog with Empower Network, this will not be a problem because of a high Alexa rank, as well as many incoming backlinks, making it a top level domain. Social media also plays a big part in your rankings on Google (7.24% according to the graph). Make sure your posts have social sharing buttons for Google+, Facebook, Twitter, Linkedin, etc. The more shares on social media the higher impact they will have on your rankings. Need more social media exposure? Create an Empire Avenue account and use this strategy to get more social media exposure quickly for free. As shown above, another factor is page level/keyword agnostic features (content length, readability, uniqueness, load speed). We’ve been over how you need to have more length in your blog posts while still holding the rich value of the content. We also already went over readability and making the user experience a great one. You also must make sure your content is very unique in each blog post that you publish. Google and other search engines will not stand for duplicate content or copying and pasting other bloggers’ work. Make sure your content is 99% straight from your head and in your own words. As far as the media aspect of your blogging, don’t overdo it. If you have to many pictures, videos, banners, or social media buttons on your blogs, it could really hurt your site speed. If your blog posts take more than 3 seconds to load, you will lose a large chunk of your traffic and they will just leave and go to someone else’s posts. This is just one small aspect in your ranking factors, but it could have one of the largest impacts, especially if you are starting a blog for money generation online. Slow page speed could greatly increase you bounce rate, take away a large percentage of your potential traffic and greatly decrease your potential conversions (lead generation and sales). Another 14.94% of your rankings in Google, according to the Moz.com graph, is based on the amount of content and the relevance of it to your topic. If you are blogging about basketball today and then in the middle of your blog post you decide to start talking about football, it hurts your blog’s rankings. Remember how Google is all about giving people quality content and a good user experience? Well readers that are excited about reading your post about basketball will then get frustrated and leave when you change course, by talking about football out of nowhere. So, stay on topic throughout the entire post and keep your links in close relation as well. The last 40% of the Google page rank that goes into your sites is dedicated to page rank, external links, internal links, and the quality, as well as quantity of the links. Backlinks are a huge factor in your rankings in search engines online. You need to have a large number of quality backlinks from different ranges of PR sites to show that they support you content and that you are providing a lot of value. For more on getting backlinks to your blog or website, read this. Internal links are also key to starting a blog successfully. Link other related blog posts throughout each post to help with getting people to spend more time on multiple pages of your blog. It also helps with flow of your blogs and Google will reward you for making use of these internal links. Try to get links from high PR websites. They are highly trusted by Google and hold a lot of ranking juice that could really boost your blog to the next level. Use this tool to check the page rank of any site including yours. The more high PR sites that link to you, the more valuable your content looks to Google, and the higher you will rank for keywords in search results. So when you first start a blog, it could be a few months before you actually get on the first page of Google results for decent keyword phrases. So, try and rank for very low competition keyword phrases at first that only get a few searches per month. 99% of searchers don’t go past the first page of results, so being on page 1 for some low traffic keywords is much better than being on page 10 of high traffic keyword results. There you go. You can get a ton of traffic just by using press releases, document sharing, bookmarking, video marketing, and article marketing. Combine those with social media and valuable content, and link everything back to your original blog. Plus you can even join some Facebook groups related to your blog niche and post new blogs in them for even more traffic. All of these strategies I just showed you are also completely free, in case you were worrying about your advertising budget. The only strategy that might cost you a little money is the press release marketing. Other than that you can get a boat load of free, laser targeted traffic from all of these strategies and sources! Let’s review all of the many things you’ve learned. You learned how to find a quality blog provider, write lengthy but valuable content, stay on topic, use social media, consistently publish fresh content, get quality backlinks, use external links, internal links, high page speed and keep a good overall user experience in mind when writing blog content. You also learned to use Facebook groups, press releases, document sharing, bookmarking, video marketing, and article marketing to drive even more traffic to your blog before you are even ranking on he top of search results. Don’t forget what you learned about keyword research and starting off targeting low search volume and competition for your keyword phrase rankings. Now, you everything you need to be an expert on how to start a blog that can get a ton of traffic and make a lot of money online. Thanks for reading! 2 replies to "How To Start A Blog And Make Money"
good content as you did, the internet will probably be much more helpful than ever before.